In several of the stories that I am creating, this one will be my most difficult. It's important to note, that I never met this woman. She was my husband's grandmother. She died in January 1969. I met Larry in November of 1969. One day, Flora was hanging clothes on the clothesline. She was 80 years old. That night, she went to bed and never woke up again. A remarkable story for this tenacious lady will truly become vivid and adventuresome. She loved her home, her life, her children, her grand-children…and true wife of the land. No drama, no known illness, but working just as she had done for her 80 years on this earth. This little lady was a very intentional person. She was all of 4’ 9” tall. When I started hearing stories about her from my mother-in-law....I remember hearing the details from her the stories of awe and inspiration that she had for her mother-in-law. She was so impressed about her, that when she agreed to marrying Ray (my father-in-law), she believed that her life would be molded just like his mother's -- to be a dedicated mother and a rancher's wife. It was a hard life. Simply said, Ysenia did not like her given name. When she got to the United States, after immigrating through Ellis Island in 1907 at the age of 19 her first name changed to Flora. 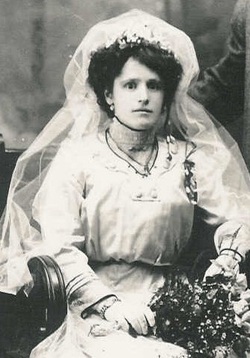 Ysenia Febronia Dolina was born to Samuele Dolina and Antonia Darani. She was the oldest child. Her mother died when she was young, so Samuele remarried and five more children filled the household. Adored by her younger siblings, they were raised in the quaint setting of a very small town in Switzerland alps of the Canton Ticino. That towns name is Chironico. It is nestled near the base of the famous Gotthard pass about 30 miles north of Lake Lugano which borders Italy. The language of this area of Switzerland is Italian. The livelihood in this area was mostly dairy and sheep. It is said that her last name from her father was originally Olina…a town UP in the alps above Chironico. They would shepherd their livestock in the late spring to late fall and then move them DOWN into the valleys to protect them from snow. Apparently the D was added to Olina, making the last name change, something common in the 1700’s of Europe. The family last names usually had a connection to their region or the community they came from. It was said that Ysenia (I think I’ll call her Flora now), would help shepherd the livestock in her girlhood. Not uncommon for the oldest child to help out. I’d like to think that there was a Cinderella complex in this story. It would give me a clear answer on why a young woman, in 1910 would immigrate on her own to the United States, a very daring scenario of the time. When she turned 21, she left home on her own. She connected with a U.S. family and immigrated as their babysitter. All census records say that she came to the US in 1910. There are no records that I can find that prove this in the US Immigration records. This was typical for young women on their own to “indenture” themselves to get to the United States. There are a couple of records I found in the Ellis Island manifest is a Dr. Y.F. Dolina and a Mrs. Y. F. Dolina..arriving on November 26, 1907. The ship arrived from Rotterdam port, ship "Saratoga". They are listed as US Citizens, so this record needs to be thrown out. There is Andy Dolina, listed as a “Third Class Alien” – meaning that were not British subjects. This ship arrived on May 19, 1907 from Southhampton, England to New York. He was from Austria (if this was a “he”), and the age is 18. I have visions of a young Flora, doing the “Yentl” imitation of a man in order to get to the United States without need of guardianship. I did go to the Ellis Island records, and there is no Flora or Febronia Dolina listed. I refined the search, I still found no one. Contrary to what her children may have thought, and considering the fact that I had already “debunked” names and places in many of my other family lines, it really is more fun to at this point create the reasons why she was so adamant on getting here. It was a well-known fact that 9 million immigrants arrived at the doors of the United States from 1901 to 1910. Names were lost, immigration officials were on the take if there were scrupulous immigrants with some money and a past to hide. I can only surmise that Flora, with no resources of her own, was bound and determined enough to indenture herself in some way to make her dream come true. I believe that she came through with a family that needed a nanny. She was perfect for the job. She had already helped raise her five youngest siblings. She was very angry with her father and her step-mother from the incident of the reprimand of her father. She did not like the stark Catholic upbringing that was so dominant in her small town. I’d like to believe that she KNEW that her best bet for an adventure and a better life was to get the heck out of Switzerland. Along with the desired opportunities of America…there was a large immigration of Swiss dairymen coming out of the Ticino area. Many of them being recruited to California to implement and lease large properties throughout Northern California – from Santa Barbara up to Eureka. As those young men left the sparse area of the Swiss alps – mostly Italian, so did the prospects of a husband. There is no doubt in my mind, that along with her drive to get out of Switzerland, that she would knew she would somehow find a place in America that she could prosper, at least with a husband. Many women had no choice. They had only one way to financial gain, and that was through marriage. Especially if you came from this area of Switzerland. Flora went across country on a train and landed in Rocklin (near Sacramento). She somehow ended up in San Francisco and met Michele (Mike) Anzini at a dance in San Francisco. Mike was working as a butcher. He had immigrated in 1896 at the age of 15 or 16. His older brother Silvio (known as Sam) was an opportunist with a brilliant degree of business. He sponsored his young brother to work with him into the Tomasini dairies of Marin County. This was leased by a Ben Anzini – very likely a relative from Switzerland…working on that connection-- and then later they worked on a leased ranch in Solano County. Mike left him there and went into San Francisco to work as a butcher for an Italian meat shop. It was kismet. They met at a dance, they married. They had much in common, mainly their language. They both grew up in the Ticino area of Switzerland, and were very familiar with the dairy/livestock industry. In 1912, they married in San Francisco, and had their first three children there. Sam, frugal and thrifty managed to obtain a large ranch in the Southern Humboldt County area, via the Swiss-Ticinese (or the Swiss Club of San Francisco). He asked Mike and Flora to move there and take care of the ranch. In 1918, an indentured lease was signed by Sam for Mike and Flora to lease this ranch at the rate of $850.00 per year. There was approximately 2,000 acres on this property. Mike hopped on the train to Alderpoint, in Southern Humboldt County, with several head of cattle, to set up the ranch for his young family. Several weeks later, Flora, pregnant with baby number four, arrived at the train station , got off at the little town and had to ask directions to the Old Scott Ranch. They were pointed up a very steep hill towards the ranch, about 1 to 2 miles up. They made this place their home forever. Flora and Mike had 9 children. Six were born on this ranch. Four sons and five daughters grew up in this area of beautiful pastures and mountains. Many times the children would ask their mother “Mom, what does Switzerland look like? Will we ever see it?” She would wave them off and tell them to go outside and look around…”it looks just like Switzerland”. She moved without hesitation and never went back to Switzerland. She would correspond with her brother and sisters, and exchange photos. A woman of basic simple needs, a family of her own, no requirement to go to church, and the undeniable determination to just “dance”.